You get the Airaid 101mm Cold Air Intake and the DiabloSport Intune for the 2005-2006 Ford Mustang. Keeps the hot air out and the cold air in. Increases of over 30HP and 30 ft-lbs at the rear wheels. The DiabloSport Intune includes tunes specific to the Airaid 101mm Cold Air Intake. The DiabloSport Intune is pre-loaded with a custom tunes/calibration for the Airaid 101mm intake. DiabloSport is well known for there Intune tuner and it will unlock the hidden power of your Mustang and fine tune your vehicle for the added airflow of the Airaid cold air intake. Ultimately, the Airaid Intake and DiabloSport Intune kit will allow you to upgrade your vehicles performance by installing this kit but is also flexible to allow you to adjust the tuning. The DiabloSport Intune will become a valuable tool during future upgrades for your vehicle. To meet the technological challenges associated with todays complicated engine management systems, including the one found on the new Mustang, AIRAID has developed an all-new intake system that delivers more horsepower and torque, along with a deep throaty sound, WITHOUT the need for an aftermarket computer programmer. AIRAIDs hot, new intake system for the 2005-2009 Mustang 4.6L V-8 (p/n 450-172) is actually two intake systems in one. AIRAIDs newest Cool Air Dam intake utilizes Modular Venturi Technology to generate an additional 17 horsepower and 21 lb/ft of torque while maintaining proper air and fuel ratios across the entire RPM range WITH THE STOCK PCM TUNING. The system boasts a 4-inch = 101mm roto-molded intake tube, larger than any other intake on the market for a BEEFY look, that is mated to a lightweight composite Cool Air Dam.What makes AIRAIDs system different from the rest is the Modular Venturi Tube. The MVT is what maintains proper air/fuel ratios with the stock electronic tuning. But in order to take advantage of such serious performance bolt on such as high-lift camshafts, big-port cylinder heads, headers and other high-performance parts, the MVT can be removed for even more horsepower and torque gains when used with DiabloSports Intune's included the custom Airaid tunes with the MVT removed. This gives serious Mustang performance enthusiasts the ability to retain the AIRAID intake as they add serious performance upgrades to the car without worrying about the need to upgrade the air intake for added air flow. Unlike many other intake systems that are on the market today, AIRAIDs new 2005-2009 Mustang 4.6L V-8 intake system makes great horsepower and torque WITHOUT the need for aftermarket tuning. AIRAIDs Modular Venturi Technology is the secret and the claims are easily backed up on the dyno in fact, the 2005 Mustang GT used for this install generated an additional 17 rear-wheel horsepower and 21 lb/ft of torque with the factory programming, Modular Venturi Tube installed, and original exhaust system. Expect even greater gains with MVT Tube removed and optional pre-installed DiabloSport Performance tune made for the Airaid Intake System.. The heart of the new Mustang air intake system is an AIRAID Premium Synthamax high-flow air filter which is isolated from engine heat by a computer-designed Cool Air Dam. Synthamax is a synthetic fiber material that traps the smallest dirt particles that ordinary cotton-gauze performance filters cant capture without inhibiting air flow. That translates into improved air flow over stock and dramatically improved throttle response and power. As is the case with all AIRAID products, the 2005-2009 Mustang Intake System comes with Airaid's No Hassle Warranty. AIRAID Premium Filters are constructed using the finest materials available today. All AIRAID Premium Filters utilize a urethane body that wont crack or curl like our competitors rubber units. Filtration is second to none with the Airaid's proprietary Synthamax dry synthetic layers. All AIRAID Premium Filters are 100% reusable and feature a Lifetime Guarantee. The Synthamax filter can be easily cleaned using common household mild detergents such as Simple Green and Formula 409. Just spray the outside your chosen cleaner, rinse with low pressure water from the faucet, and let it air dry. Easy to do and you don't even have to buy a special "filter cleaning kit". We test to SAE standard J726, the method for testing fractional efficiency of a filter. We could say that we capture 99.997 percent of particles of 10 microns and larger, most air filters, capture the full range of particulates, even down to 2 microns. Our filters are so efficient that we test all the way down to 0.3 microns. At 2 microns, our filters capture almost twice the percentage of particulates that our competitors do, and more than 6 times the amount at 0.5 microns. 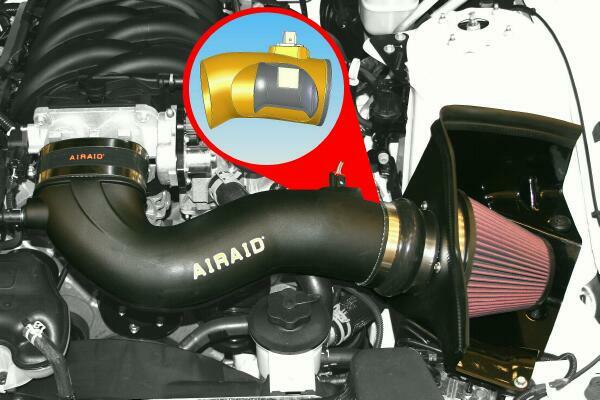 AIRAIDs new Mustang Air Intake System comes complete with all the necessary mounting hardware and complete, detailed instructions for easy installation. The install can be accomplished by the average driveway mechanic in about an hour. The following photos highlight a typical installation. If youre a 4.6L V8 Mustang owner looking to unleash the hidden horsepower and torque that is sitting under the hood of your car, without the use of aftermarket programmers, then AIRAIDs new 4.6L V8 Mustang intake system is worth checking out. Plug the Intune cable into your diagnostic port located under the driver side dash. If leaving the MVT insert inside of the intake tube, then choose from the standard Diablo tunes. There are different tunes for different octane fuels used in the vehicle. 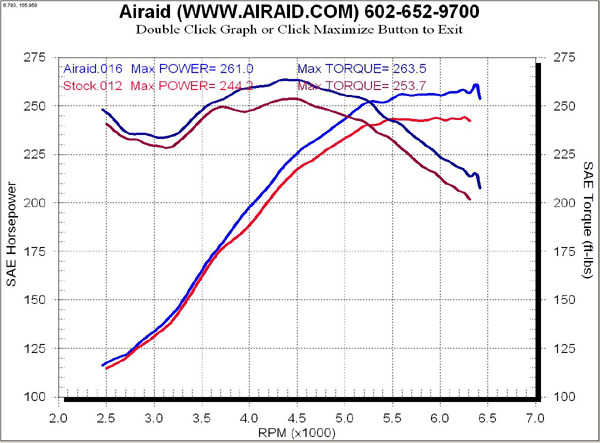 If you are removing the MVT insert from the intake tube, then you must choose from the Airaid CAI tune(s). There are tunes for other CAI (cold air intakes) listed but you must choose from the Airaid CAI tunes when you are removing the MVT insert from the intake tube. You can also choose to modify any of the tunes to correct the speedometer, raise speed governor, and other advanced parameters. The DiabloSport Intune will record and save your original OEM software and then install the new tune you chose. You will prompted to go through a series of key cycles and screen prompts during this process. Total install time for the tuning during the initial installation is about 15 minutes. have been extremely pleased with this purchase. i've gained 6 mpg on the interstate using the intake. easy to install. would recommend to anyone!